Orange County, FL – Orange County Mayor Teresa Jacobs is joining mayors across the country in asking residents to make a commitment to conserve water and cut pollution by taking part in a national contest aimed at drastically slashing water and energy use across the nation — and in return residents can win a new Toyota Prius Plug-In, water saving fixtures, and hundreds of other prizes. The Wyland Mayor’s Challenge for Water Conservation, April 1- 30, is a nonprofit national community service campaign to see which leaders can best inspire their residents to make a series of informative through easy-to-use online pledges to reduce water and energy usage. 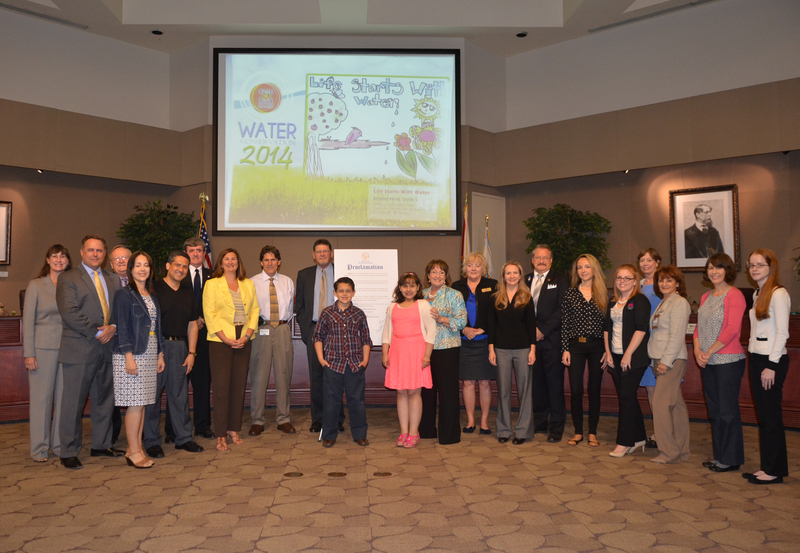 At the March 25 Board of County Commissioners meeting, Orange County Mayor Teresa Jacobs proclaimed April as Water Conservation month and announced her support of the 2014 National Mayor’s Water Challenge. The cities of Maitland, Ocoee, Orlando, Windermere, Winter Garden and Winter Park are joining Mayor Jacobs in her efforts to encourage residents to take the pledge to conserve water, save energy, and reduce pollution throughout the month of April. Mayor Gary Bruhn from the City of Windermere, Vice Mayor Linda Frosch from the City of Maitland, Miranda Wright Justice, Water Conservation Coordinator from the City of Ocoee, Rick Howard, Public Works Director, from the City of Orlando, Angie Ewanitz, Water Conservation & Recycling Coordinator from the City of Winter Garden, and David Zusi, Water and Wastewater Utilities Director from the City of Winter Park signed Orange County’s proclamation in support. Oakshire Elementary School fifth-grader Adianez Perez was also recognized for her design of Orange County Utilities Department’s 2014 calendar cover. More than 2,800 students from Orange County Public Schools, grades kindergarten through twelfth, participated in the annual calendar contest. Perez, along with her parents and brother were in attendance to celebrate her achievement. The water challenge is another component of Orange County’s Sustainability Plan, known as “Our Home for Life,” which continues our efforts to create a future in which Orange County will be known as the best place in the world to live, work, play and raise a family. The purpose of the plan is to make Orange County a more prosperous, healthy, and livable community for current and future generations by addressing economic, environmental, social and cultural issues that enhance our quality of life. The third National Mayor’s Challenge for Water Conservation is presented by the Wyland Foundation and Toyota, with support from the U.S EPA’s Office of Water, National League of Cities, U.S. Forest Service, The Toro Company, Wondergrove Kids, Bytelaunch, and WaterSmart Software. To participate in the water challenge, citizens may enter online at www.mywaterpledge.com/national. Those who take the challenge are entered into drawings for hundreds of eco-friendly prizes, including home improvement gift cards, home irrigation equipment, and a grand prize Toyota Prius Plug-In. Last year, residents from over 1,000 cities in all 50 U.S. states pledged to reduce their annual consumption of freshwater by nearly a billion gallons, reduce waste sent to landfills by 18.3 million pounds, and prevent more than 69.9 million pounds of hazardous waste from entering our watersheds. A variety of photos from the meeting are available for use by the media and are located on Flickr.